During this time, the cloud goes on collapsing, always under the effect of gravity. But there comes a time when the pressure of the compressed gas inside the star, together with the radiative pressure generated by the nuclear reactions at the core of the star will reach an equibrilium with the gravitational effect, and so prevent the collapse from going any further. At this time, the star is in a hydrodynamic equilibrium, and, in a way, it's stable. It is situated on the main sequence of the Hertzsprung-Russel diagram, where it will stay as long as about 90 % of its life. It is burning its hydrogen, and transforming it into helium. 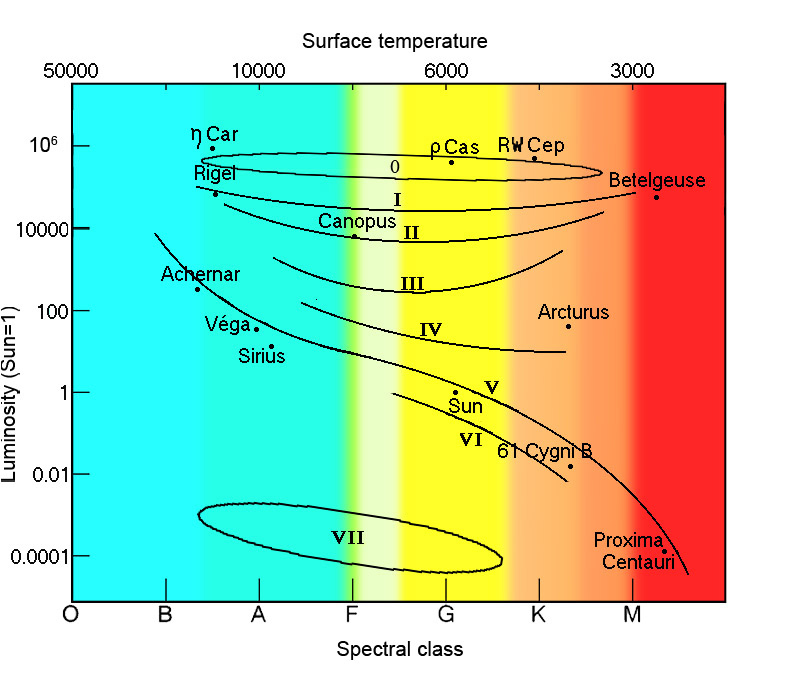 The Hertzsprung-Russel diagram, so called after the works of the Danish Ejnar Hertzsprung and the American Henry Russel, is a graphical representation of the stars according to their surface temperature and their luminosity. The temperature of the star is equivalent to its color. The star, at least its surface, behaves - virtually - like a black body. Its luminosity is directly dependent upon its mass. Actually, the more massive the star is, the more gravity crushes its core. The internal gas, which is compressed, will increase its pressure in order to fight against the collapse, and so will also increase its temperature. This increase of the temperature will favour the nuclear reactions. By the way, the radiative pressure will increase, too. 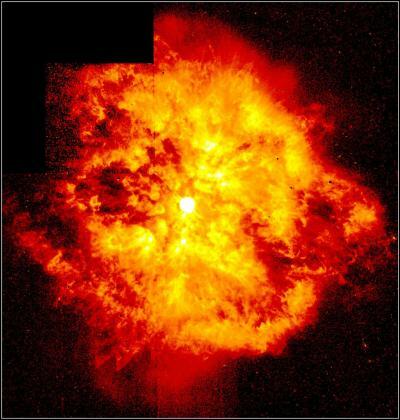 By increasing the rate of nuclear reactions, the star burns more fuel, and faster. This fact will increase its luminosity, but shorten its lifetime. In order to remain stable via hydrostatic equilibrium, a star's luminosity increases as Mp , where M is its mass. The value of p varies between 3 for very massive stars, and 4 for stars whose mass is less than 10 solar masses. The lifetime of the star is just the ratio between its available fuel, and its comsumption rate, i.e. its luminosity. So, the lifetime of a star is proportional to 1/Mp. By drawing the stars upon this diagram, you can see that the greatest part of the stars are situated in a strip which comes from the upper left (very hot and luminous) to the lower right (cold and not very luminous). This strip is called the main sequence. 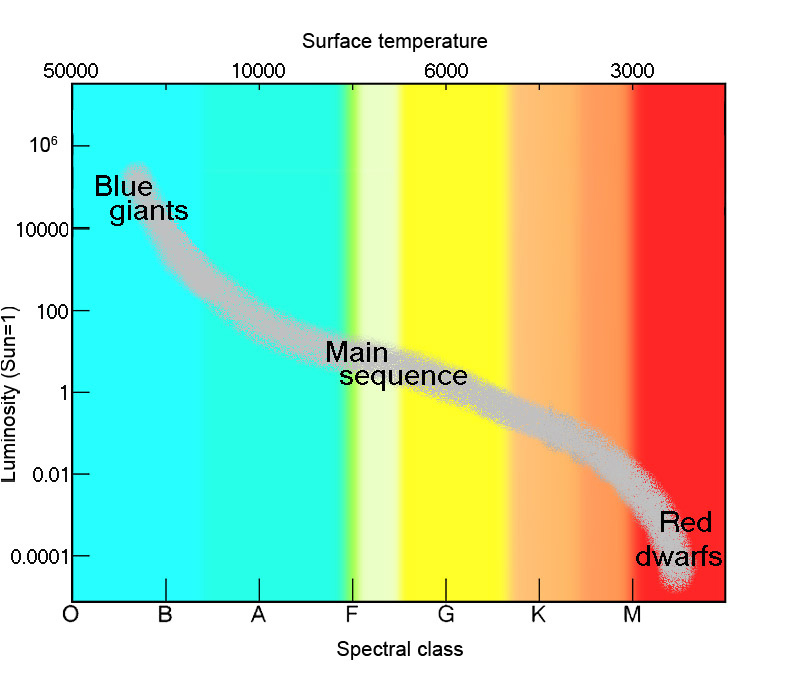 The stars of the main sequence are classified in 7 main groups, called spectral classes, from the hottest to the coldest : O, B, A, F, G, K, M.
Inside each of these groups, we further divide into subgroups, from 0 to 9, always from the hottest to the coldest. So, the hottest stars, O and B, are blue, and the coldest, in the M group are red. Our sun is a star in the G2 class, so its surface temperature is about 6000 K. It radiates mainly in the yellow part of the spectrum. In order to completely define the spectral type of a star, one adds another classification, written in roman numerals, based on the luminosity : from Ia, the luminous supergiants, to V, the main sequence stars. Class VI corresponds to subdwarf stars, equivalent to class V stars, but less luminous, because poorer in heavy elements. Class VII corresponds to the white dwarfs, that we will study further. Class 0 corresponds to hypergiant stars. These stars have a very high mass -until 100 to 150 solar masses - and are very luminous. To be classified as 'hypergiant', a star must have a very large size and a relatively large mass loss rate. Of course, these stars have a very short life, about some million years only. They are also very rare -only 7 yellow hypergiant stars are known within our galaxy, hence they are very difficult to study. Note : Stars in the class 0 are sometimes noted as Ia-0 or Ia+. The most massive stars, of type O or B , can produce strong stellar winds, which are propelled far away from the star by their magnetic field. The most extreme case is the Wolf-Rayet stars. Their surface temperature can be as hot as 50.000 K.
Their main characteristic is a very important ejection of materials, more important than a O class star. They are also stars outside the main sequence, which means that they are burning helium in their core instead of hydrogen. These stars seem to be coming from O or B stars at the end of their life. By emitting an intense extrem ultra-violet radiation, these stars strongly ionize their neighbourhood, creating large H II areas. Stellar winds of the most massive stars will scatter these clouds, letting the inside born stars to appear. How heavy can be a star ? The answer is not simple. First, we are often unable to obtain a direct measurement of this mass, and secondly, as we have just seen, the heavier is the star, the shorter its lifetime. Very massive stars have a very short lifetime (1 to 3 million years), and we have only a few chances to be able to observe one. 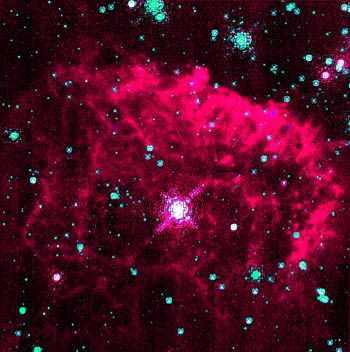 The Pistol Star, in Sagittarius, is thought to be 100 solar masses, what would be the heaviest known star of our galaxy. Its emitted power is about 10 million times the solar power. Estimations are of about 200 solar masses at its creation, and it loses important mass quantities which are used to create the surrounding nebula. The star LBV 1806-20, as for it, is estimated to weight 200 solar masses, but it could be a double, even multiple system. Current star formation theories seem to limit the initial mass of a star at 120 solar masses in order to provide its stability. Some studies estimate that the very first stars of the universe could have had a much larger mass, perhaps up to 1000 solar masses. Of course, the lifetime of these stars was exceedingly short, but they would have sowed the universe with heavy elements quite early.